One of the most common mistakes a lot of riders make is failing to stay properly hydrated while out on their bike. Hydration packs are one of the most convenient ways to carry water and other accessories when you ride. Hydration packs have come a long way since their inception in the late 1980s, when paramedic Michael Eidson was gearing up to enter the “Hotter’N Hell 100” race in Texas, USA. He wanted to be able to carry more fluids than a regular bottle & cage would allow, without having to make complicated and awkward modifications to his bike. Ingeniously, Eidson took a medical IV (the kind you normally see hanging from a drip-feed rail), wrapped it in a sports sock, pinned the it to the back of his jersey, looped the tube over his shoulder and held it in place with a clothes peg. 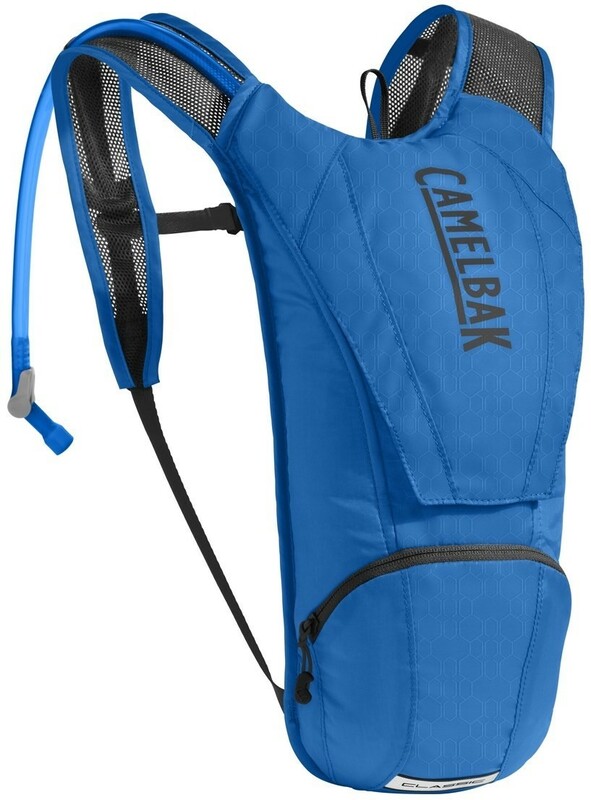 Shortly after, Eidson founded CamelBak. Fast forward 25 years and the huge range of hydration packs now available means there is something out there to suit every type of rider, but which one is the right one for you? Aside from a few exceptions, hydration packs are typically available with 3 bladder volumes: 1-1.5 Litre, 2 Litre and 3 Litre. The bladder volume is usually quoted separately from the luggage carrying capacity, although as you would expect the general rule is that the larger the bladder, the larger the luggage capacity and vice versa. When buying a hydration bladder, remember: The recommended fluid intake while exercising is 500ml per hour minimum, so bear that in mind when purchasing your hydro pack. 1 – 1.5 Litre bladders will be sufficient for children, leisure cyclists or short distance training sessions & commutes. Quite often these will have zero carrying capacity, however they are popular with road cyclists who prefer the convenience of a hydration pack drinking tube vs. faffing around with a regular water bottle. With this limited capacity, it is likely you will need to stop and refill at some point on a reasonably long ride. 2 – 3 Litre bladders are the most popular size. They strike a balance between the lightweight and minimalistic convenience of a 1L pack, but with the benefit of carrying a greater volume for longer excursions. For all-day-long riding sessions you may need to top up on fluids at some point however. 3+ Litre bladders are recommended for long distance touring rides where you might find yourself a long way away from a clean water supply, or simply on all day rides because you don’t want to have to stop to refill a water bottle. 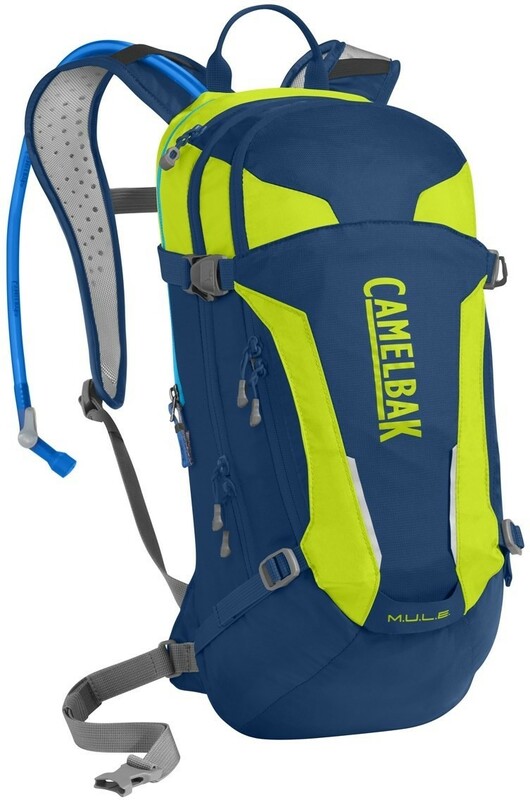 You can fill a 3L reservoir with however much fluid you need instead of brimming it every time you use it, and with the added carrying capacity that comes with packs that have larger bladders, these are generally the most versatile hydration backpacks. If you’re going to be spending a whole day out on the bike, you’re probably going to want to take a few things with you besides water. Spare inner tubes, tools, food, a change of clothes, wallet, phone, keys, torch, jelly beans and whatever else you may need for a day out on the bike. You will have to consider how much carrying space you’ll need to make sure you don’t have to leave anything behind. If you already have pannier bags, saddle bags or keep your absolute essentials tucked away in your jersey back pocket, you may not even need a hydration pack with carrying space built in. The convenience of being able to take a drink from your pack hands free and without stopping pedalling is a huge benefit all on its own. Small, zero-cargo packs with up to 2 Litre reservoirs are low bulk, lightweight and comfortable to wear and don’t sit high and proud on your back, which would just make a mockery of the carefully designed aerodynamic bike you’re riding. Still very minimalistic when it comes to carrying additional kit. You will fit a spare tube, small multitool and one or two CO2 canisters into 2 Litres of carrying space, but don’t expect to fit much more in there. Often these small packs are limited to external net carrying pouches, rather than zipped internal pockets, so take care not to leave any dirt/moisture sensitive items like phones exposed to the elements. 10 Litres of luggage carrying is ample for most casual riders. You will be able to fit a few items, such as a short pump, spare inner tubes, trail tool and possibly a packable jacket & lightweight overtrousers into packs this size. Most of this carrying capacity will be internal and high quality packs may even feature a soft fleece-like lined security pocket to protect your delicate smart-phone screen. This amount of carrying capacity really starts to open up the options for how you use a hydration pack. You can take everything you’ve squeezed into a sub 10L pack, and fit in a good few extras. For example, if you commute to & from the office each day, you will have room for a pump, multi tool, a spare tube or two, a set of tyre levers, a puncture repair kit, shirt, trousers, small shower towel, shower gel and deodorant. These super-sized hydration packs not only carry plenty of water, but have ample carrying capacity for everything you could possibly need out on your bike, and are perfect for long-distance touring rides or overnight adventures. Tools, tubes, food, waterproofs, spare clothing, towels, or even just the weights from your dumbbells if you’re training. Most hydration packs use the standard shoulder, chest & waist strap design to help keep your pack where you want it, and prevent it from flopping around all over your back like an angry salmon. Higher quality packs will include features like elasticated waist & chest straps which allow you greater freedom to breathe from your stomach and are less likely to chafe while you do so. More and more mountain bike specific hydration packs are coming to market with spine protection already built in. 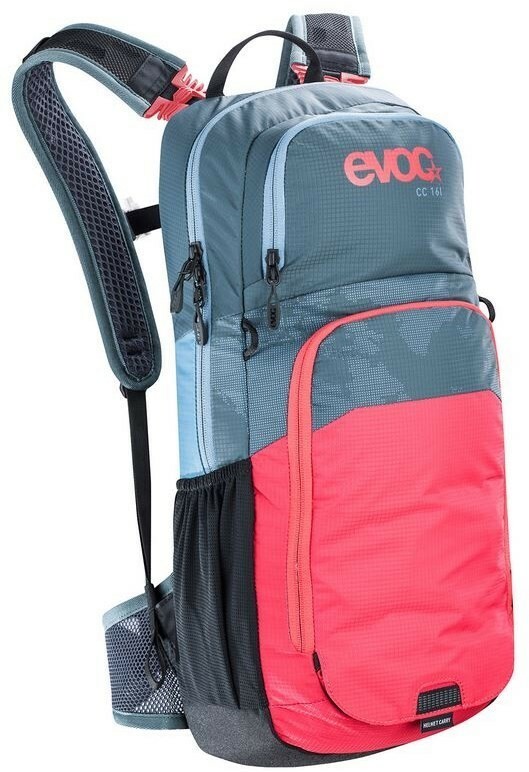 Evoc have their Freeride series with a ‘CE certified Liteshield safety device’, while Deuter’s ‘TUV/GS certified PSA back system made from a visco-elastic foam’ also protects your back in the event of an accident. If you’re used to using water bottles and keeping them clean after every ride, taking care of your hydration pack is no more of a chore. If you fill it with flavoured drinks and forget to clean it, mould will quickly spread and can be difficult to fully remove from tight corners. The CamelBak Antidote cleaning kit is primarily meant for use with their own Antidote reservoir, however the clips, brushes and tablets are equally suitable for cleaning almost any hydration bladder from any brand. The kit includes dispersible cleaning tablets, and a long-reach flexible brush for cleaning the inside of the feeding tube.